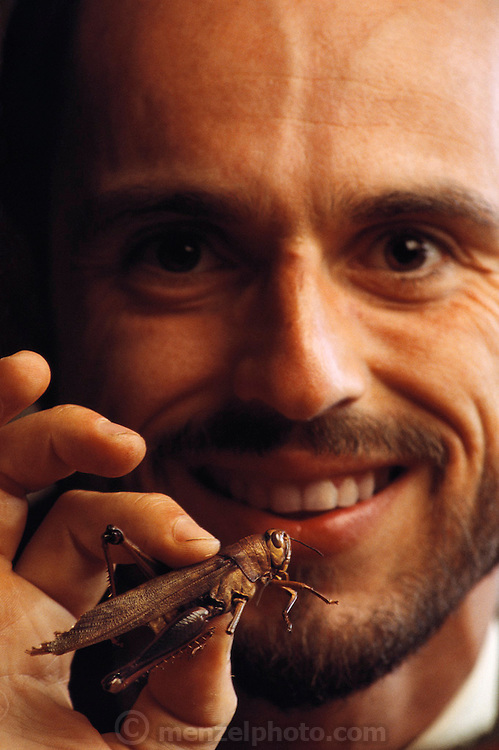 Bruno Comby, author of "Delicious Insects" (in French) holds a grasshopper before eating it. Comby lives and works in the Orkos Institute in the 17th century Chateau Montrame outside of Paris. His institute serves a raw diet he calls "instinctology" and describes as the Paleolithic nutritional practice by early human hunter-gatherer ancestors. Comby grows insects in cages for food. Image from the book project Man Eating Bugs: The Art and Science of Eating Insects.